The living area is filled with all sorts of technology. Your puppy’s tiny teeth might take a liking to chewing loose cords. Make sure before you take your puppy home, all your charging cables are hidden away, along with anything else that may be at risk of being chewed up - magazines, shoes and pillows are more puppy favourites! Keeping indoor plants out of reach from your pup is a good idea as they may chew on the leaves and some can make them very ill. Instead, encourage your puppy to munch on chew toys, many of which also provide dental and educational benefits. While certain areas of your house may be out of bounds for your puppy, especially before they’ve been toilet trained, your pup needs a designated space for quiet time, complete with bedding and/or a crate. The kitchen is filled with fascinating scents and items that your puppy will love to explore, but their curious and highly sensitive nose could lead them to into potential danger. We recommend that you secure your shelves with childproof latches, so your puppy stays out of your food, sharp knives and cleaning products. Also, the bin is another place your pup’s nose might them lead to - you should keep garbage in a hard to reach space to avoid them ingesting any toxic food. There are open bodies of water in the bathroom that you must keep your puppy away from as even shallow pools can be a drowning risk. Don’t forget to always keep the toilet lid down so they cannot fall inside. Everyday items in the bathroom can potentially be a threat to your puppy if they ingest them so move soap, medications, razors and other threats to locations where your puppy will not be able to reach them. Toilet paper is also a very tempting toy for puppies that can cause a big mess, so keep the toilet door closed when you can. Your bedroom will certainly be an area of interest to your new puppy as they get to know more about your scent. Clothing, shoes, socks and other chewable items should be secured for the safety of your puppy, and for your own benefit! Try anti-chew sprays, they can work wonders by repelling puppies with a bitter taste. As curiosity grows, your puppy will explore with their mouths and so you want to ensure that anything that could potentially be swallowed is out of their reach. Common household objects can pose a danger to your puppy when ingested include jewellery, batteries, hair ties, coins and insect repellents. If your pooch will be able to access your children’s rooms, ensure that toys are off the floor as they may be small enough for your puppy to swallow. When you first get your puppy, they should never be allowed outside without your supervision. 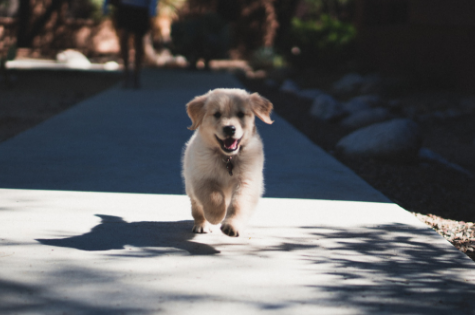 Before they even get to their new home, you still need to check that your fences are stable and there is no way that your puppy can escape by digging under, wriggling through or jumping over a gate. If you have a green thumb, keep your lawn fertilisers, insecticides, automotive chemicals and other poisonous substances far away from your puppy, and if possible, try to avoid using them. 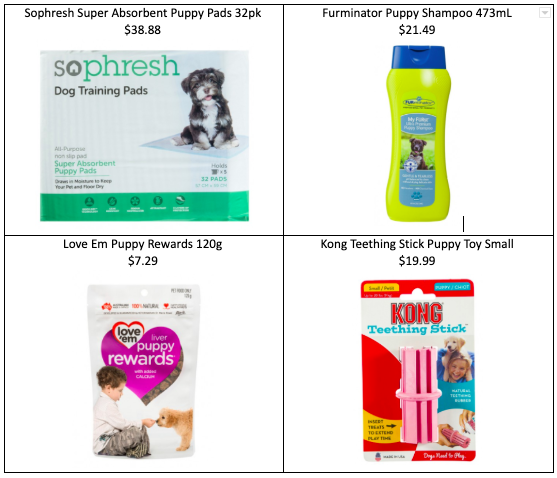 Petbarn offers an extensive range of products including collars, ID tags, leads, bowls, puppy treats, beds, chew toys to help with teething, play toys to stop boredom, waste control bags and toilet training products including puppy pads. Petbarn’s and Greencross Vets' Puppy Schools cater to puppies between 8 and 16 weeks old who have had at least one vaccination 2 weeks prior to their first group class. Registrations are open now and spaces are limited, with a maximum of eight students per course, so contact your local Petbarn or Greencross Vet to enquire about availability. Wherever possible, Petbarn also encourages pet adoption and has partnered with animal welfare charities across the country to run the Petbarn Adoption Program.